A Ben Hill Griffin Stadium-record 90,907 fans were present as the No. 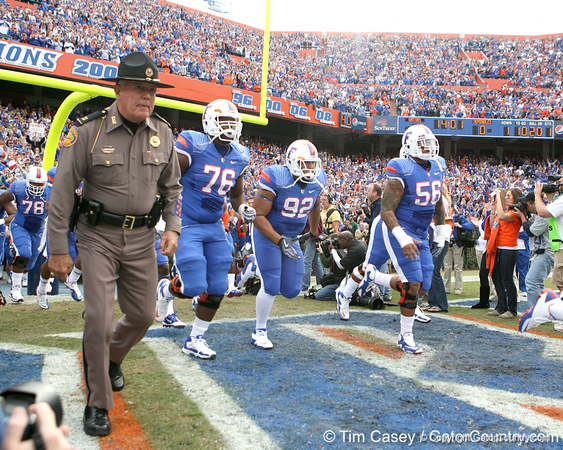 1 Gators bid farewell to 22 seniors with a 37-10 defeat over Florida State Saturday at Florida Field. Already the winningest class in SEC history, the 2009 seniors helped UF extended the Gator win streak over FSU to six games. Andrew Blaylock, Troy Epps, Christopher Scott, Jim Barrie, Christopher Coleman, Chris Pintado, Corey Hobbs, John Fairbanks, Mike Williamson, Jonathan Phillips, Rick Burgess, Cade Holliday, Wondy Pierre-Louis, Dustin Doe, Joey Sorrentino, David Nelson, Brandon James, Jermaine Cunningham, Riley Cooper, Ryan Stamper, Brandon Spikes and Tim Tebow were introduced for the final time at home after their career achievements were announced.